Licensed Insolvency Trustees: Who are we & what does that mean? Choosing a debt advisor is an important step in your overall debt recovery. Licensed Insolvency Trustees are the only federally regulated debt advisors in Canada. 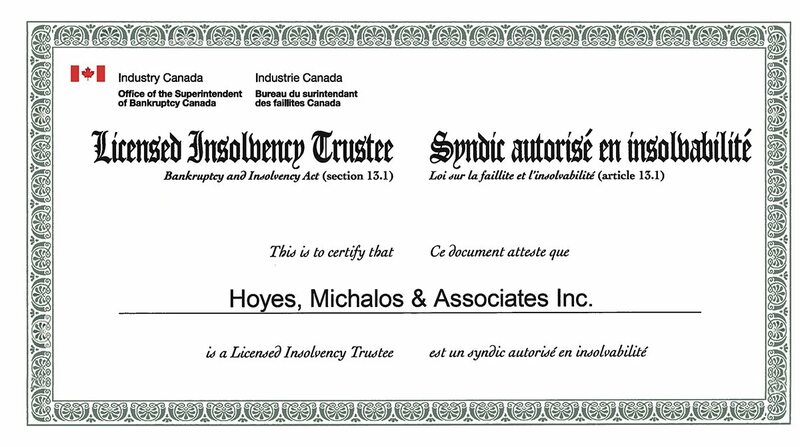 Hoyes Michalos is a Licensed Insolvency Trustee with offices across Ontario. When you meet with us for debt advice, our promise to you is that you always meet with an accredited, licensed expert before you sign your documents. Our job as a Licensed Insolvency Trustee is to create a “win-win” situation for everyone involved in the process. Nobody wants to go bankrupt, and no creditor wants to lose money, but since in some cases a bankruptcy is the only solution, I act as the referee. I make sure that the process is fair to all parties. Since starting Hoyes Michalos in 1999 I believe we have met that objective: all parties are satisfied that we worked together to achieve the best solution. Bankruptcies and consumer proposals in Canada are debt restructuring options available under the Bankruptcy & Insolvency Act. Increasingly today consumers are choosing to file a consumer proposal and avoid declaring bankruptcy. To help consumers more easily recognize and identify individuals licensed to provide debt restructuring services (both bankruptcies and consumer proposals) under the Bankruptcy & insolvency Act, the Office of the Superintendent of Bankruptcy Canada has issued a new directive changing the designation of a bankruptcy trustee to Licensed Insolvency Trustee (LIT). This change may help individuals struggling with debt identify those who legitimately provide government programs to eliminate debt from debt consultants who are not licensed by the federal government. That means individuals previously called bankruptcy trustees, or trustees in bankruptcy, will now be called Licensed Insolvency Trustee. Does this change the bankruptcy services we provide? No. But what it does do is help remove some of the fear people may have in talking to a ‘bankruptcy trustee’ and make it clearer to individuals that Licensed Insolvency Trustees provide a wide range of debt management solutions including proposals to creditors. The LIT designation still requires the same rigorous training and education as before. To become a Licensed Insolvency Trustee individuals must pass a comprehensive oral examination which requires knowledge and experience. Only individuals licensed through the federal government as Licensed Insolvency Trustees can administer bankruptcies or consumer proposals in Canada. Meet with you before you sign to review your debts and your financial situation in order to help you find the best debt management solution available. That may or may not include any type of insolvency proceeding under the Bankruptcy & Insolvency Act. The role of a Licensed Insolvency Trustee is still to help you consider all of your options, not just bankruptcy. Collect information from you and prepare the necessary documents to be filed with the government. This is the official start of your insolvency proceeding, whether it be personal bankruptcy or a consumer proposal. Notify your creditors, accept and review all claims, and otherwise administer the insolvency process. For consumer proposals, that includes recording votes to determine if a proposal has been accepted by creditors. Ensure you complete all necessary duties and apply for your discharge or completion certificate, based on the type of insolvency proceeding you choose. In the end, the important point is that the professional you work with is licensed and has the training and experience needed to help you eliminate your debt. Licensed Insolvency Trustees are just those experts. There are a lot of different types of debt advisors in Ontario and across Canada including federally Licensed Insolvency Trustees, accredited not-for profit credit counsellors to for profit debt consultants. Licensed Insolvency Trustees are the most highly trained and educated debt advisors in Canada. Almost all Licensed Insolvency Trustees have an accounting designation and a university degree. All must complete and pass a rigorous bankruptcy and law course and be investigated by the RCMP before being granted a Trustee license. Talking with a LIT ensures that you are getting qualified advice. A Trustee is not just for bankruptcies. Trustees consult with individuals looking for solutions to their debt problems every day. Not all end up going bankrupt. Some will file a consumer proposal but even more will be provided with suggestions and solutions that will allow them to deal with their debts on their own. A Licensed Insolvency Trustee is the only debt professional required by their mandate, under law, to explain all your debt relief options. They can help you evaluate other debt settlement or debt relief programs. They can be a great second look. Your initial consultation is free. Trustees offer free, no-obligation consultations to review your debt relief options. There is no fee just to talk with a Licensed Insolvency Trustee about your situation. No up-front fees, no pressure. You really have nothing to lose by contacting a Trustee for advice. Options available through a trustee cost less than other debt solutions. In terms of debt relief options, in most cases, it will cost you less to work with a Licensed Insolvency Trustee than other debt consultants. Bankruptcy payments are based on government guidelines called surplus income limits, and proposal payments are based on a settlement of your debt for much less than you owe, resulting in a payments that are often 20 to 30 cents on the dollar. Compare this to a debt management plan through a credit counselling agency that requires you to repay 100% of your debts. All trustee fees are included as part of your bankruptcy or consumer proposal payments. There are also no extra, hidden or up-front fees to worry about unlike unlicensed debt consultants. A Trustee doesn’t work on your creditor’s behalf. This is one of the biggest myths surrounding licensed insolvency trustees there are. The Trustee makes sure that both your rights, as the debtor, and the creditor’s rights are respected. They ensure that the process is fair for all involved and that everyone follows the rules. A Trustee and insolvency proceeding protects you. When dealing with a Licensed Insolvency Trustee, you are protected by the fact that they are regulated by the federal government, that they follow a stringent code of ethics, and that there is a mechanism in place to mediate any disputes you might have. When you file, there is a legal stay of proceeding that protects you from further actions by your creditors including a wage garnishment and harassing phone calls. A Licensed Insolvency Trustee can guide you through the process. Filing bankruptcy or a consumer proposal is a legal process and having a licensed Trustee on your side can help you manage it efficiently and quickly. Your trustee will answer all of your questions about how to file bankruptcy or how a consumer proposal works. Our goal is to make sure you are successful in receiving your discharge and that you ultimately eliminate your debts. You should choose a Trustee you’re comfortable with. Find an experienced Trustee who you can trust and build a relationship with is essential, because you will be working with them for at least 9 months. Your trustee should answer your questions and make sure you understand the process before you file and should be willing to provide support about the process both during and after your bankruptcy. When people ask me who I work for, I explain that as your Licensed Insolvency Trustee I’m like the referee in a hockey game; I’m not working for one side or the other. I am legally appointed by the court. Our job is to give you a fresh financial start. A bankruptcy or consumer proposal is the legal process we administer to do that. But the process starts with a free, confidential consultation.